Home Terrorism The Missing Martyrs: Why Are There So Few Muslim Terrorists? The Missing Martyrs: Why Are There So Few Muslim Terrorists? Why are there so few Muslim terrorists? With more than a billion Muslims in the world--many of whom supposedly hate the West and ardently desire martyrdom--why don't we see terrorist attacks every day? Where are the missing martyrs? In this startlingly counterintuitive book, a leading authority on Islamic movements demonstrates that terrorist groups are thoroughly marginal in the Muslim world. Charles Kurzman draws on government sources, public opinion surveys, election results, and in-depth interviews with Muslims in the Middle East and around the world. He finds that young Muslims are indeed angry with what they see as imperialism--and especially at Western support for local dictatorships. But revolutionary Islamists have failed to reach them, as can be seen from the terrorists' own websites and publications, which constantly bemoan the dearth of willing recruits. Kurzman notes that it takes only a small cadre of committed killers to wreak unspeakable havoc. But that very fact underscores his point. As easy as terrorism is to commit, few Muslims turn to violence. Out of 140,000 murders in the United States since 9/11, Islamist terrorists have killed at most three dozen people. Of the 150,000 people who die each day, worldwide, Islamist militants account for fewer than fifty fatalities--and only ten per day outside of the hotspots of Afghanistan, Iraq, and Pakistan. The real bulwark against Islamist violence, Kurzman finds, is Muslims themselves, who reject both the goals of the terrorists and their bloody means. With each bombing, the terrorists lose support among Muslims. 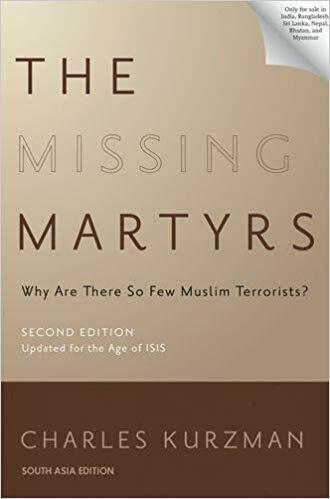 Incisive and authoritative, The Missing Martyrs provides much-needed corrective to deep-seated and destructive misconceptions about Muslims and the Islamic world. The threat of Islamist terrorism is real, Kurzman shows, but its dimensions are, so far, tightly confined.